The past twenty years have seen a real surge of interest in the San. Since the end of Apartheid in South Africa, more and more attention has been paid to the story of the indigenous people of the Cape, the first people Dutch settlers encountered in 1652. Although relations did not immediately sour, the next century and a half saw the progressive dispossession of the Khoikhoi and San and the disintegration of their society. The San in particular — generally identified with foragers, as opposed to the Khoikhoi pastoralists — were driven to more and more marginal land as the Dutch East India Company’s demand for cattle grew ever greater. The latter half of the eighteenth century was particularly violent, marked by state-sanctioned robbery, massacre, and forced labor. In 2011, Mohamed Adhikari convincingly argued that these events constituted a genocide of the San people. Adhikari’s book was released a year after The Broken String (2010), although it retrod the ground that historians such as Susan Newton-King and Nigel Penn (notably in The Forgotten Frontier, 2005) had already demarcated in painstaking detail. This, then, is the context in which The Broken String intervenes. In particular, this film documents the story of the Bleek-Lloyd collection, probably our most important source for understanding San society. Between 1857 and 1875, Wilhelm Bleek (a German linguist) worked with his sister-in-law Lucy Lloyd to conduct, record, and translate interviews with a few dozen San people — most of whom were prisoners in Cape Town. Bleek’s interest was first aroused as a linguist exploring the development of language by documenting two San tongues, ǀXam and !Kun, before they disappeared. The texts he and Lloyd created not only provide our only sources for these languages but further tell rich stories of dispossession and survival. One of these stories, translated as the “Song of the Broken String,” furnishes the film with both its title and its connecting thread. As the director Saskia van Schaik narrates, through their work Bleek and Lloyd gradually shifted from scientific interest in the San to an attitude marked by empathy and collaborative spirit. Their informants were invited into the Bleek-Lloyd family home in Mowbray, which seems to have been a warm and welcoming environment. Sadly, Bleek died at the age of 48. Lucy Lloyd continued transcribing and editing the collection they had assembled, eventually publishing a selection of stories as Specimens of Bushman Folklore in 1911. The full extent of their work, though, only became known after the Bleek-Lloyd collection was assembled and cataloged in the archives of the University of Cape Town. [The site] is valuable to me. It’s //Kabbo’s heritage. Unfortunately, Schaik has chosen not to represent some of the most important voices in this story: those of the modern-day descendants of the San. It is true that the genocide of the eighteenth century led to complete disintegration of San society and the extinction of four of the five ǃUi languages. Nǀuu, the last extant language, has only three fluent speakers, although revitalization efforts are underway in collaboration with the University of Cape Town. On the other hand, as this example demonstrates (and as has been corroborated by the research of Jose Manuel de Prada-Samper) important continuities do exist between San communities of the past and present-day people of the Cape. Schaik does seem to recognize this fact, since she bookends her film with (contemporary) footage of a celebration among the Coloured community of the Cape. As Schaik seems to imply, this celebration echoes the cultural practices that Bleek and Lloyd documented in the nineteenth century. Why, then, did Schaik not take the additional step of interviewing some of these celebrants? Why is the testimony of people who today claim some continuity with the San not included in The Broken String? 10, 000 pages filled with strange characters and a translation in Victorian English that is all that remains of the language of the /Xam, the original inhabitants of the northern part of South Africa. At other points in the film, too, Schaik speaks of the San practices as existing since “time immemorial” — their destruction made poignant by the existence of the Bleek-Lloyd collection. 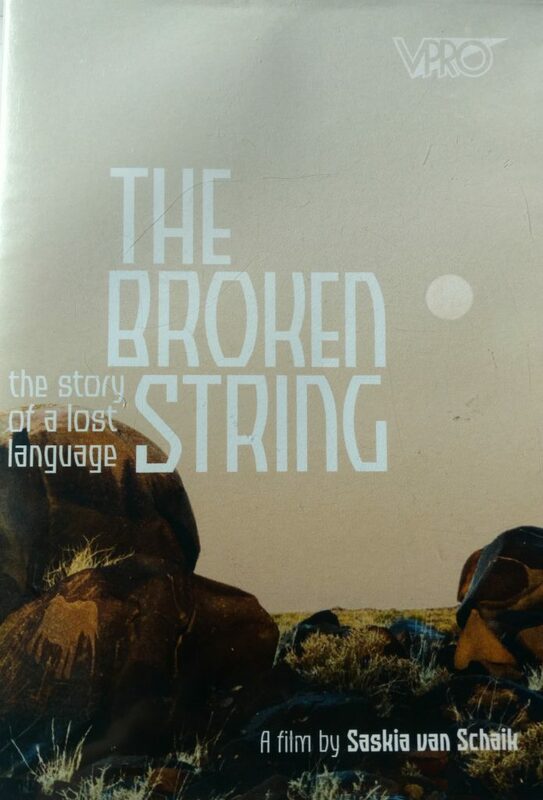 The Broken String is ultimately concerned not with the San people, then, but rather with the records created by Wilhelm Bleek and Lucy Lloyd. Although the film bills itself as telling “the story of a lost language,” its neglect of continuity between the past and the present means that it is confined to telling the story of the Bleek-Lloyd collection, not the San people or the |Xam language. So be it, one might say: although not ideal, a conservative approach like this does have its benefits. One could not accuse Schaik of trying to overplay her evidence or to tell a story that she does not really know. I truly wish that Schaik had been bolder. When watching The Broken String, I couldn’t help but be reminded of Patricio Guzmán’s masterful Nostalgia for the Light (Nostalgia de la Luz, 2010). Guzmán reflects on space, memory, and persistence in Chile by weaving together the story of astronomical observation and Pinochet’s concentration camps, which both took place in the late 1970s in the Atacama desert. The massive alienness of the desert and the grandeur of galaxies and nebulae — like the windswept plateau of the Northern Cape — provide a deeply moving counterpoint to the horrific violence inflicted on their ground. Place is thus interrogated as a site of violence even as Guzmán commingles the immense time scales of astronomy with the agonizingly short instants in which lives were forever ended. In short, Guzmán uses the resources of human story-telling and nature’s beauty (as mediated through his camera) to adeptly manipulate the connections of time, space, and violence. Schaik’s own interrogation of time and place in The Broken String falls short. As she narrates, Wilhelm Bleek at first approached the San looking for a fossil, an “old” language that could furnish us with evidence for the evolution of language and the development of man — in much the same way that Darwin, just a few years prior, had used fossils to establish his theory of natural selection. Bleek’s approach to his informants evolved as he learned more about the tragic past of the San and also as he invited them into his home. Schaik does not seem to have taken the time to inhabit this story in the same way. If we are to take The Broken String at its word, the San people had existed since “time immemorial” until their tragic demise at the hands of European colonialists. Our only access to their story is through the records of Bleek and Lloyd, which give us unmediated access to a different time. The narrative The Broken String presents does a disservice to its subjects not only by eliding the rich continuities that stretch through to the present day but also by thus foreclosing the case for any redress — the very kind of redress addressed so eloquently in Frances Reid and Deborah Hoffman’s film about the Truth and Reconciliation Commission, Long Night’s Journey Into Day (2000). Although The Broken String is worth watching without a doubt, its timidity leaves one searching for more. Adhikari, Mohamed. The Anatomy of a South African Genocide: The Extermination of the Cape San Peoples. Athens, OH: Ohio University Press, 2011. Penn, Nigel. The Forgotten Frontier: Colonist and Khoisan on the Cape’s Northern Frontier in the 18th Century. Athens, OH: Ohio University Press, 2005.